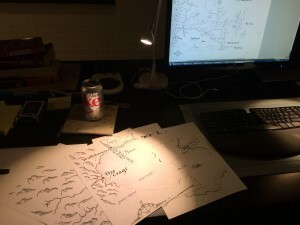 Today, in the middle of working on The Current Work, alias Book 5, I was seized by the absolute certainty that I could not take another step without having a physical version of the map of Rowan’s world. Something on paper, upon which I could actually draw by hand. 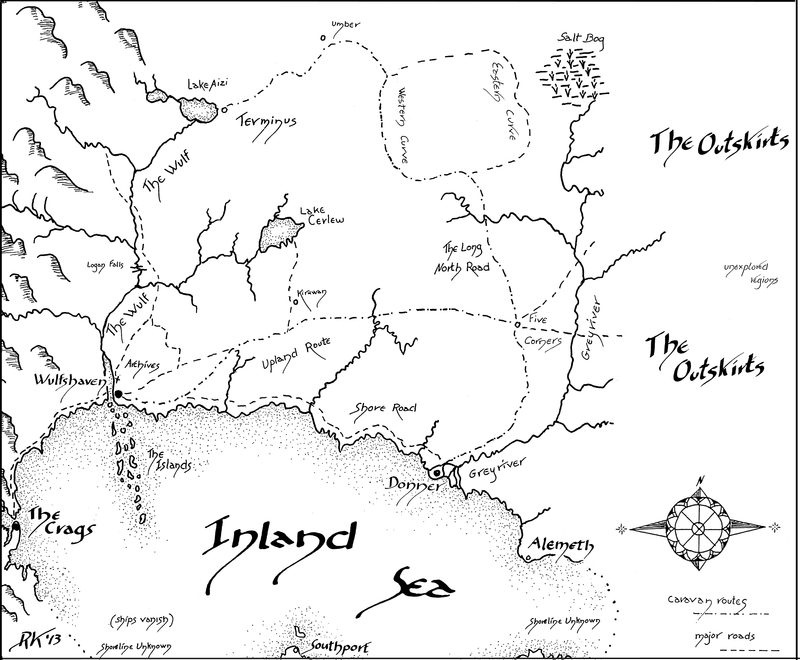 When the map was originally created, it was pen-and-ink on Bristol board, which the possessed the lovely attribute of being an object: a thing I could hold and draw directly upon. Amendments and experiments went in pencil until finalized, then finished in ink. It was … satisfying. Since then, of course, I’ve migrated it over to a digital version. This has the advantage of being clean and easy to reproduce. And I can scan handwritten labels, arrange them as needed, and generate a nice crisp copy to put in the ebooks — not to mention a cool zoomable online version. 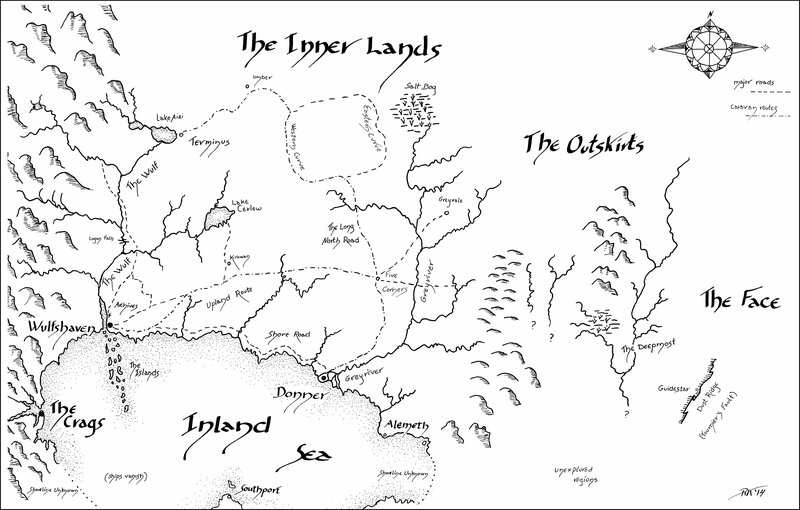 But one of the features of the series is the way that Rowan’s view of her world expands, so the maps change from book to book. 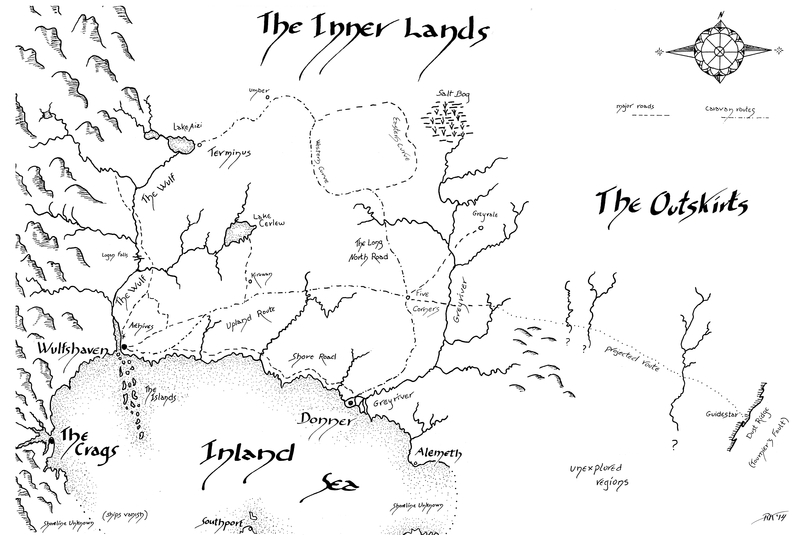 It’s time to add more: new areas, and some finer-grained details for existing areas. But drawing stuff in with a mouse is too clumsy and weird-looking. But worse: the on-screen, digital map is just too small. 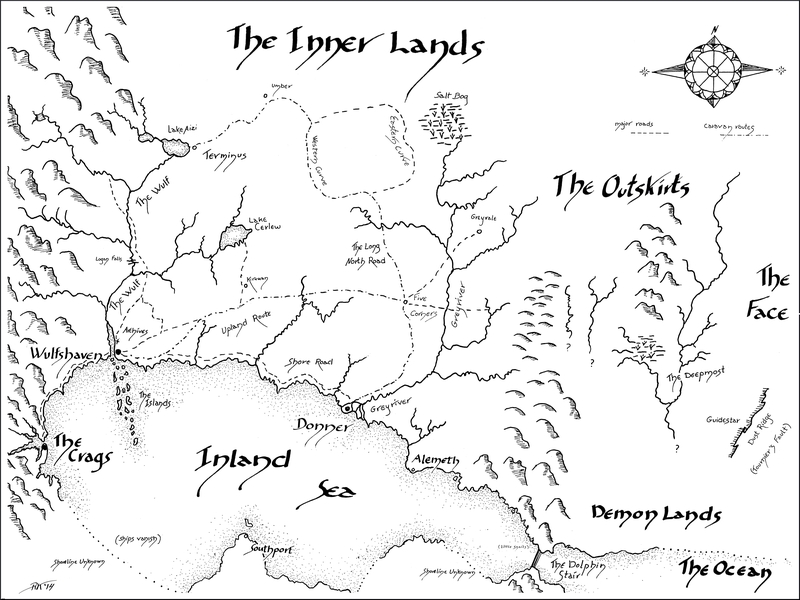 I can zoom (and so can you, if you go to the digital versions online, Book 1, Book 2, Book 3, Book 4), but then I see only the up-close area, and lose sense of where that portion fits in the great sweep of geography. Things outside the frame effect things inside the frame, and I have to be able to know what’s there in order to decide what should be here. And, in the grand tradition of life imitating art, I just now realized that everything I said above is absolutely analogous to issues of actually writing the book. That is, in order to know what’s right to put in this book, I have to remain aware of what’s outside the frame. Well. Our pal, the metaphor. Heh. Anyway, I spent an annoying amount of time getting the current Master Chart to print out physically, since I want the chart to be BIG. And my printer only prints on standard paper. So I have to print it out in pieces, and then stick the pieces together. Now, I did already have a biggish version of the current map, laboriously segmented by hand, printed out a page at a time, and stuck together. I actually covered it with clear contact laminate-on-a-roll, and put it up on my wall. I can, to a certain extent, use dry-erase to draw on it… although erasing requires the use of rubbing alcohol. And dry-erase doesn’t do detail well. Plus: it was hell to produce! After much fuss and research, I have learned that Excel — that spreadsheet software, the number-cruncher’s friend — can do exactly that. How odd. Not an ad for Diet Coke. So. All printed out, ready for trimming and taping. Plus, now I can print out sections at even closer scale, as often as needed. For my own purposes, I’ll have to get down to street level in some places.. In other news: Over on Twitter, Zack Weinberg sent me a link to an article in The Atlantic, with images from a geostationary satellite as it looks down on our world… which he pointed out was rather like [SPOILER DELETED — BUT YOU KNOW EXACTLY WHAT I’M TALKING ABOUT]. Lovely images, and a link to a video which caused my computer to crash repeatedly because my internet connection in my writing office is a sad little trickle of bandwidth. But I can watch it at home– you can watch it now.